Place the chocolate and butter in a microwaveable bowl, microwave on high for 1-2 mins until melted. Stir until the mixture is smooth and leave it to cool. In a large bowl, whisk the eggs and sugar together using an electric mixer for approx 5 minutes. Pour the chocolate mixture into the egg mixture and fold it in gently. Sift in the flour and again fold it in carefully, without overmixing. 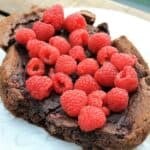 To make the brownies in a slow cooker, place a large piece of baking paper in the slow cooker pot, then spray it with cake release spray to prevent sticking. Pour the brownie mixture into the lined pot. Place around 100 g of raspberries on top of the mixture and press them in gently. Place the lid on the slow cooker, with a tea towel tucked under the lid to catch condensation and prevent drips from falling onto the brownies and making the top soggy. Bake on high for 1-2 hours, until the edges are firm. Times really vary according to your slow cooker so keep an eye on it and take it out when cooked. The centre should be firm underneath when you check it with a knife, and not too gooey, but the top in the centre should remain a little soft, to make the brownies nice and fudgy.